As a parent, you want the best for your child. That includes healthy teeth and a pleasing smile. At Central Jersey Orthodontics, our goal is to treat your children as if they were our own, by providing them with the best possible orthodontic care. To have a smile that’s good for life, your child needs teeth and jaws that are properly aligned – in other words, a healthy bite. The American Association of Orthodontists recommends that children see an orthodontist by age 7. Scheduling your child’s first orthodontic check-up around this point in your child’s life is perfect because before that age, it might be a little too early to fully evaluate what needs to be done. After the age of 8, it is possible we may miss a critical window of opportunity for orthodontic troubleshooting. At Central Jersey Orthodontics, Dr. Sirena will evaluate your child’s facial pattern to look for proper balance, symmetry, and growth. She will count the number of teeth, take appropriate x-rays, and make sure you know where, when, and how to go about helping your child get all their teeth into a great smile with the correct alignment. Dr. Sirena also believes that it’s critical to make sure every child feels comfortable getting check-ups before actual treatment is needed. Regardless of the type of treatment needed, the key to making sure that your child has the best dental experience possible starts with a great doctor/patient relationship. Dr. Sirena will take the time to make sure your child feels safe and comfortable so they will actually enjoy visiting the orthodontist. For some children, their first orthodontic check-up may reveal that their bite is fine. For other children, Dr. Sirena might identify a developing problem, but recommend monitoring your child’s growth and development until treatment can be started at the optimal time. In other cases, some children will have problems with their bite that require early treatment. Why do children need to be evaluated at such an early age? Early diagnosis and treatment may prevent or intercept more serious problems from developing and may make treatment at a later age shorter and less complicated. In some cases, Dr. Sirena will be able to achieve results that may not be possible once the face and jaws have finished growing. Early treatment can guide erupting teeth into a more favorable position, preserve space for permanent teeth, and reduce the likelihood of fracturing protruded front teeth. If early treatment is indicated, Dr. Sirena can guide the growth of the jaw and incoming permanent teeth into a more favorable position. Early treatment can also correct the width of the upper and lower dental arches, gain space for permanent teeth, avoid the need for permanent tooth extractions in the future, reduce the likelihood of fracturing protruded front teeth, reduce the likelihood of impacted permanent teeth (aka. teeth that are blocked from erupting normally), correct thumb sucking, and eliminate abnormal swallowing or speech problems. In other words, appropriate early treatment can simplify and shorten the amount of time needed for comprehensive treatment once all the permanent teeth have erupted, and it can also ensure the stability of the final results. How can I tell if my child has a problem with his or her bite? Malocclusions (“bad bites”), like those illustrated below, may benefit from early diagnosis and referral to an orthodontic specialist for a full evaluation. 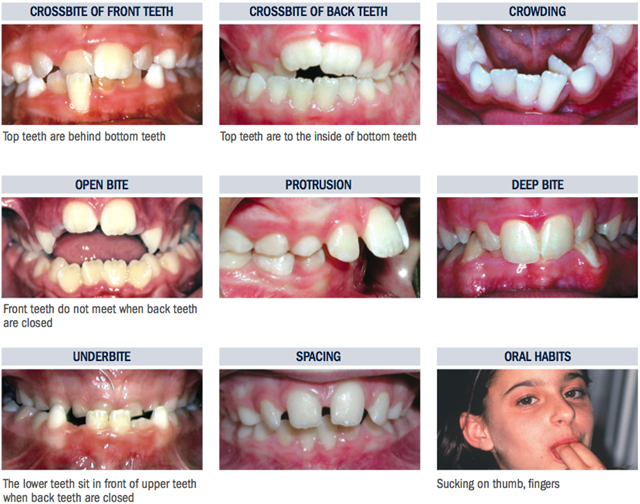 If your child has one or more of these dental issues, please contact us by setting up a free consultation. We would love to discuss your child’s orthodontic options and develop a treatment plan that is customized to your child’s needs and desires. Early treatment does not necessarily benefit all children. Certain types of orthodontic problems can be more easily and efficiently corrected in the teen years when all the permanent teeth have erupted. Some skeletal orthodontic problems should not be addressed until growth is more advanced or completed. Dr. Sirena will develop a treatment plan based on your child’s specific needs. If Dr. Sirena decides your child is not ready for treatment, they are placed on our orthodontic observation program. The orthodontic observation program is for children who are not ready for treatment. We normally see these children every 6 months for “observation appointments” so that we can monitor their facial and dental development and check for normal eruption patterns of permanent teeth. There is no fee this program and it helps the orthodontist determine the optimal time ot begin treatment and achieve the best possible result for your child.